Roy Laidlaw had to be patient for his Scotland debut, warming the bench on ten occasions before finally making his bow against Ireland in the 1908 Five Nations. Laidlaw first came to the attentions of the Scotland selectors following several strong performances for Scotland 'B', but a combination of Alan Lawson and Dougie Morgan originally barred his way into the blue shirt. 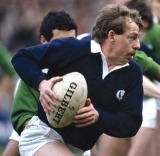 Laidlaw went on to win 47 caps for Scotland, and played all four Tests of the British and Irish Lions' unsuccessful tour to New Zealand in 1983. Having been called into the squad following injuries to Terry Holmes and Nigel Melville, Laidlaw was powerless to stop the Lions slipping to a whitewash defeat. He played in a large number of games on tour however, filling the No.9 shirt in 13 of the 18 games, scoring two tries and skippering the side against West Coast and Wairarapa Bush. During his time with Scotland Laidlaw partnered fly-half John Rutherford a record 35 times.